I finished a block for Tahlia in our Hearts DYB Round Robin. Tahlia made blocks featuring some of her favorite things. Barbara did the one with the bunny that would have been my first choice to work on (and did a lovely job on it! ), so I had to choose a different block. When there isn't a particular block in a group that calls to me, I try to pick one that will challenge me and that's how I chose Tahlia's Volcano block! 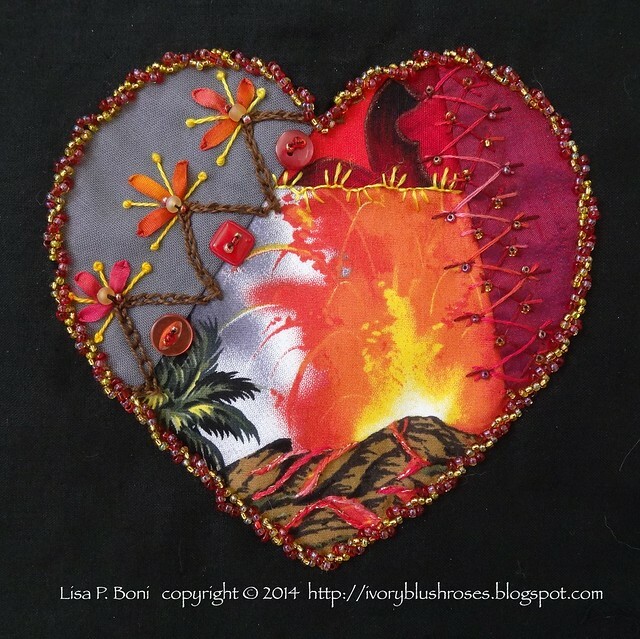 I rarely work with red and yellow (though that seems to be changing lately), and certainly had never stitched anything to do with a volcano before! While looking through my stitching idea book, I saw a seam idea that looked remarkably like volcanoes, so that was what I stitched on the left seam. On the right seam, I used a layered herringbone stitch. I've been seeing so many layered stitches on antique crazy quilts and it's something I rarely do. Around the perimeter, I did a beaded straight stitch in red and yellow. I loved the way it picked up the lava colors from the focal fabric. I was going to add some stitching in the corners, but ended up loving how that expanse of black set off the glow of the heart so I left it as is. I moved my stitching area into the painting studio a couple of months ago. I find I love stitching with the window to look out of. Apparently, I thrive in chaos when I'm stitching. 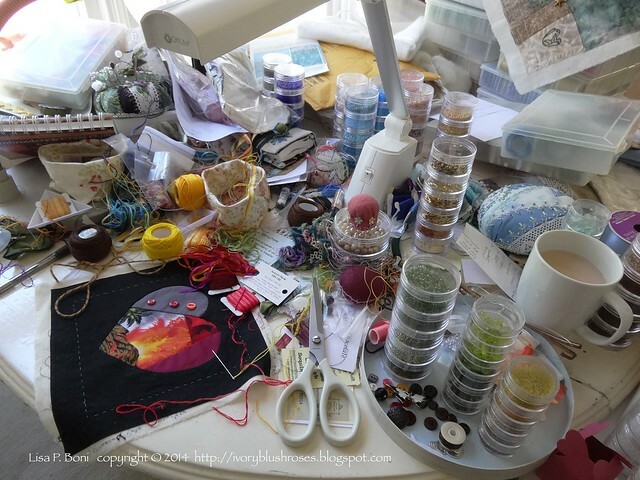 I'm not sure why inspiration comes so much easier when I'm surrounded by this kind of jumble of materials, but I can't wait to get in there and stitch each day! 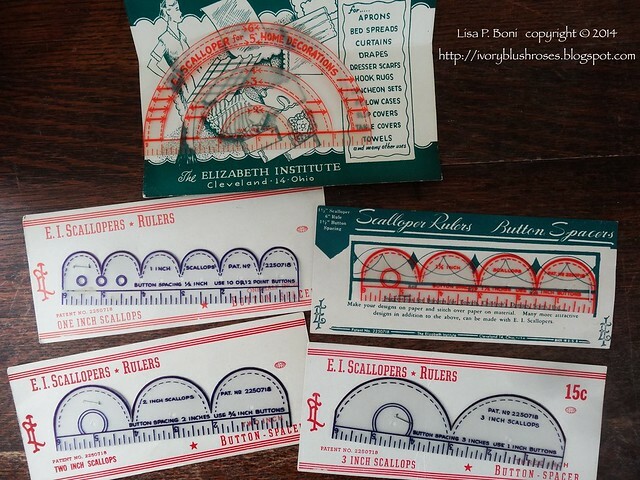 A few weeks ago, I found these lovely scallop templates on e-Bay and put a bid in on them. What fun to win them for almost nothing more than the cost of shipping! I think they will be perfect to use in crazy quilting projects and already have a couple of projects in mind that they will come in handy on! 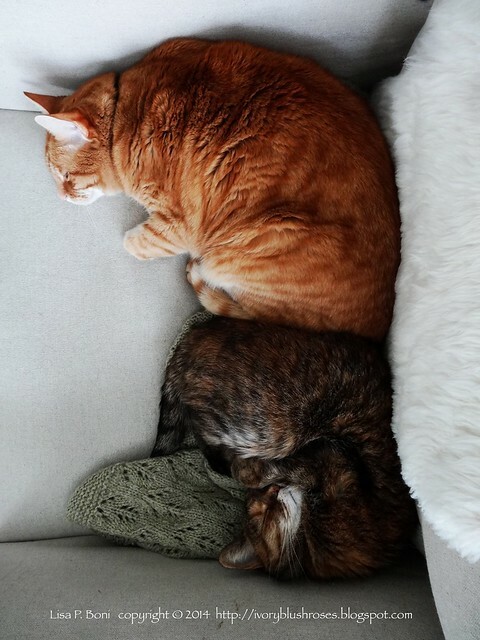 This morning I discovered Mollie and Thomas curled up in the chair together. This hasn't happened in a very long time, so it was a joy to see! They were taking advantage of my woolen shawl which had slipped down to the seat. Now if my Mom's kitty would just get used to living with my two kitties and join them, life would be grand! She's still hiding out in one room, which she almost never leaves. Makes me sad. Unfortunately, she has some issues which prevent her from being an adoptable cat, otherwise we would find a new home for her. On the way home from work yesterday, I took a detour to do some birding. I had heard that the White Faced Ibis were in the area and I've really wanted to see them. 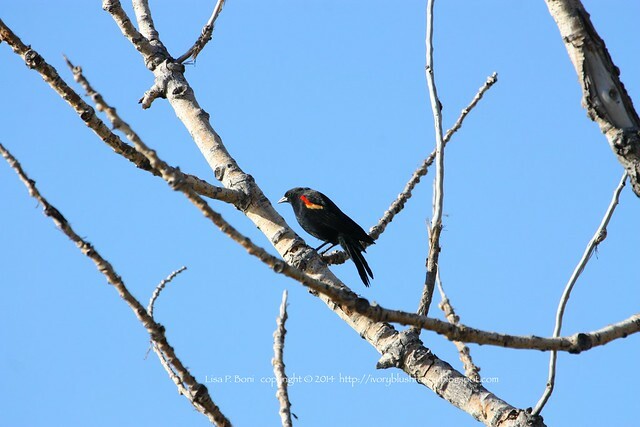 Unfortunately, they were not to be found, but I did see a lovely assortment of birds including this brilliant Red Winged Blackbird. There don't seem to be as many of them around as there used to be, so it was really nice to see a small flock of them. 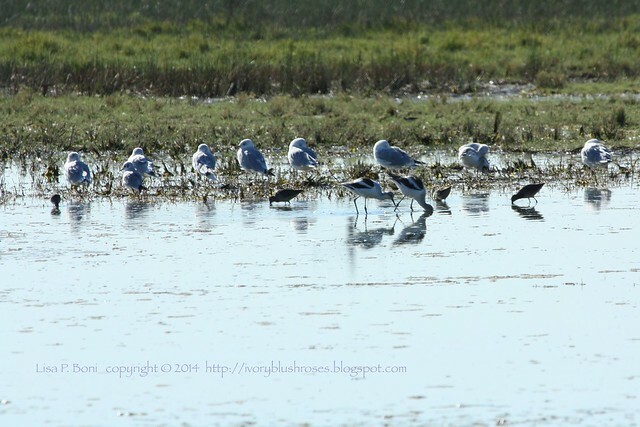 In a marshy area adjacent to an irrigated field, there were all sorts of wading birds and gulls. My ability to identify wading birds is non-existent except for a few. Sure wished my Mom and Dad could have been along to help out! 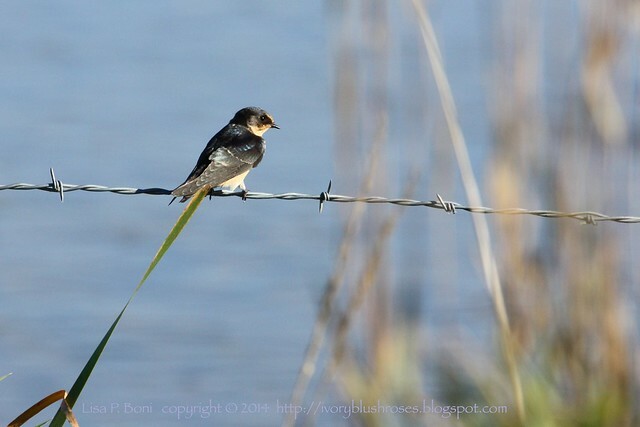 There were lots of barn swallows on the fences and flying low over the water. This one was stretching it's wing and I got a lovely glimpse of the pale underside of the wing. 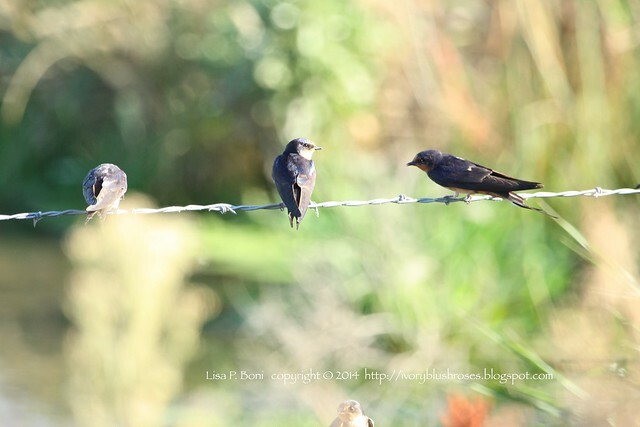 The twittering song of the swallows was a joy to hear! They have to be one of my favorite birds! 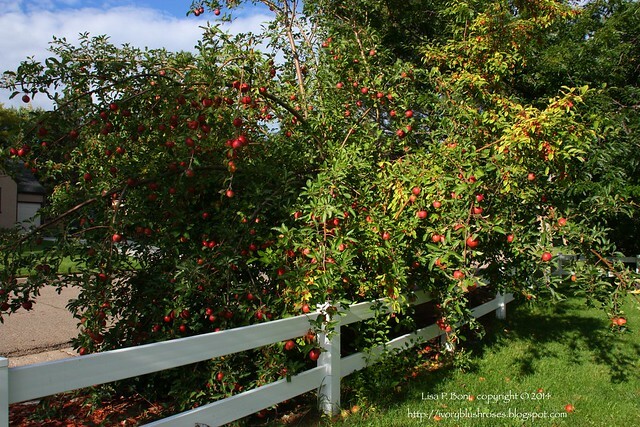 At home, the lone apple tree on the perimeter of the yard is groaning under the weight of all the apples! Last year, it had only a few and I left those for the squirrels and birds. In truth, I had forgotten all about this tree. It sits along the street on the side of the house where I rarely go. 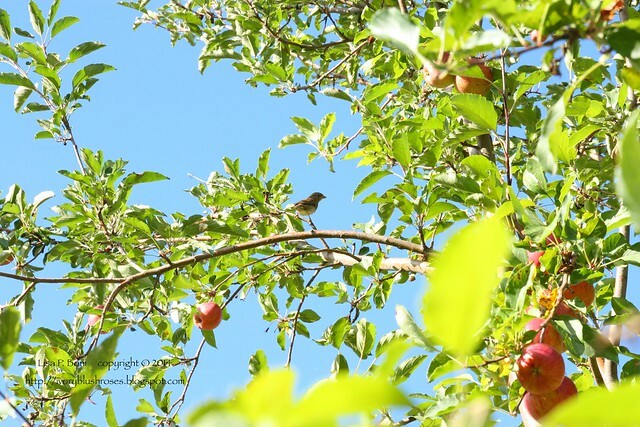 It wasn't until my daughter asked when the apples would be ripe that I thought to go look at it! 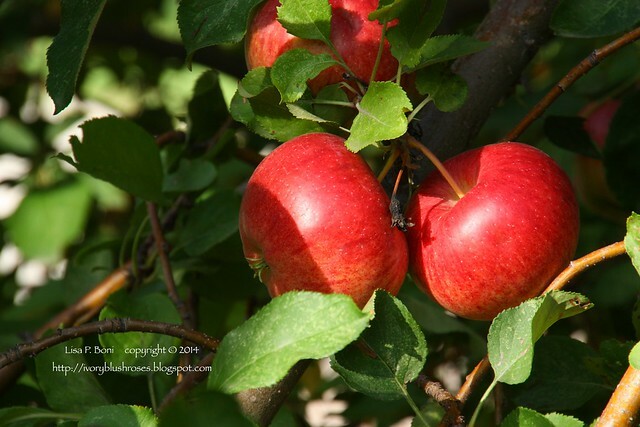 They were still mostly green at the time, but in the last couple of weeks, they have ripened to a gorgeous red! Aren't they lovely? I think it's time to pick a few and try them! That's the plan for tomorrow. 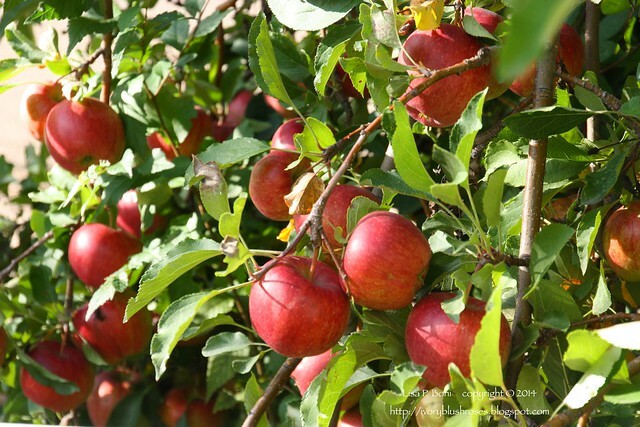 We'll pick apples, taste them and decide if we are making applesauce, making apple pies and if we need to can and freeze some to last us over the winter! The birds like this tree too! I just can't get over how abundant the harvest is this year. 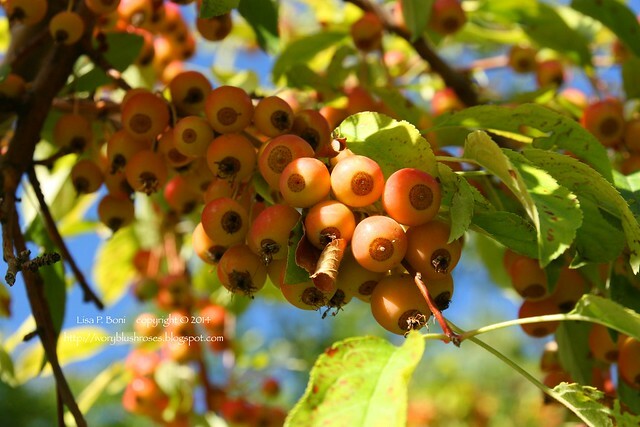 There is crabapple growing up almost in the center of the apple tree and it also has a heavy load of fruit this year! It's been a long time since I've lived in a house with an apple tree. I'd been wanting to plant one, but now that I know I have one, I may not need to! What a FANTASTIC post! I LOVE what you did with the volcano block. I loved seeing your chaotic workspace. Now I don't feel so bad. :-) I just ordered 23 tubes of beads yesterday, giving me some wonderful colors to work with. 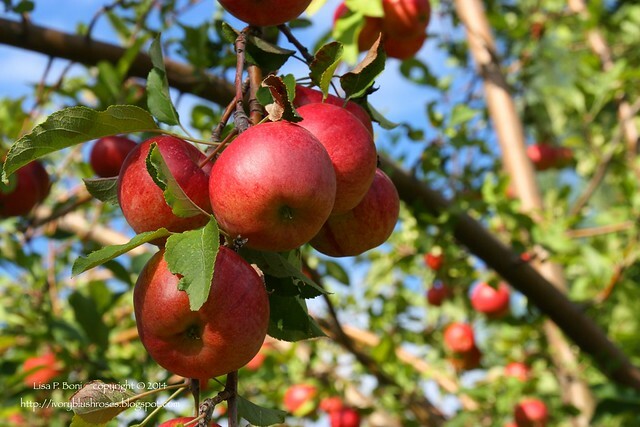 What a wonderfully loaded apple tree. Interesting block - not my colors either. Love the cats in the chair. Not much cuter than a curled up kitty. And a great work desk. It's always so fun to see someone else's mess!